As you can read from the post’s title, today (December 20th) marks my five-year anniversary (or I should say “blogiversary”) on WordPress! Since writing about my first-year anniversary back in 2014, I’ve dedicated each year to a post about the things I’ve learned from blogging, as well as myself– cliché as it sounds, I find these opportunities to reflect on my blog’s growth and how I’ve changed as a person since 2013 (which seems like so long ago, wow…). I will say that nothing much has changed since last year’s four-year milestone post— I still write about my travels, celebrity crushes, poetry, and occasional ramblings on this platform, which has been going well for me. And I still go off-the-grid from time to time (more so than not, I’ll admit), only to return for a few weeks or months before I do it all over again. That said, I guess the only difference is that I’m no longer in my early twenties, which means I can really reflect on how it is compared to back then. Perhaps I’m a bit wiser, but who really knows? But compared to when I first started this blog when I was 20, I can say that I’ve definitely grown considerably since then– even if you were to see me at 22, the difference between then and now is apparent. I guess five years is a long time in blog years. True, I see blogs which have been around for much longer, but more often than not, others come and go– a majority of them barely make it past their first anniversary, perhaps two years, if they’re lucky, and it’s a shame that they end up abandoned. My blog, then, is considered quite the survivor. Besides reflecting on my five years blogging on WordPress, I’ve also been thinking about the direction in which my blog is heading. The thought came to mind just recently, as I was taking *another* break from blogging to go on vacation. I’d been doing that for the last three or so years, and there came a point when I had to stop and wonder why I was even announcing my hiatus(es) in the first place? Maybe it was because I’ve built up such a large follow count (nearing 3000, at this point) and that I didn’t want to disappoint my Readers. Or maybe it was to reassure myself that I wasn’t “failing” to blog consistently when I’d been doing so for years. At first, I didn’t mind writing “taking a break” posts. But after perhaps the dozenth one, I was feeling it become repetitive, even a chore, to do. In fact, I was starting to feel that blogging was becoming a chore– this sentiment arose just this past year, when I was constantly traveling and, even when not, was busy with work and dealing with some mental health issues. I’d always loved to write, but it’d started to become monotonous– my creativity staled, and I was writing daily posts which, I admit, weren’t of best quality (heck, even a monkey could write some posts I’d written!). My heart wasn’t in it, but I didn’t know what to do otherwise. I guess I’m still at-loss of what to do with this blog. Part of me simply wants to continue daily blogging, even if I know that all I’ll do is write mediocre posts. Another part of me just wants to take an indeterminate hiatus, until I figure my life out. I’ve toyed with the idea of just writing posts when I feel like it, which might not be so bad. Pretty sure many of you are reading this and thinking that I’m dumb, that I should just write posts whenever I feel like it, as long as it’s quality and something that I’ll be proud of. True, but at the same time, I’m finding it hard to accept that, just because I’ve built my blog around daily posts for the last four years on WordPress. I also hate to admit that I want to be known by more bloggers, to have more “Likes” and “Comments” on my posts, and to have more Follows. It’s so incredibly superficial, but that’s how I feel. But perhaps I need to grow up and accept that this isn’t about popularity online, but rather about writing about your passions…and that the Reader Count will follow afterwards. 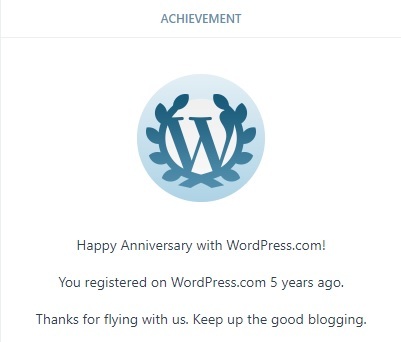 This got way too real for an anniversary post, so I’ll stop here and say that, while I may be at a crossroads on my blog’s direction, I’m glad that I’ve come a far way on WordPress (five years! ), and that I hope to continue writing into the new year, daily or not. Thanks for reading! Congratulations on three years! Time flies, eh? Thanks, Jess. You make good points. These thoughts have been on my mind for several years, even more so in the last few months. I think it’s because I’m getting older, having less free time to write, and also feeling stalemated in writing that has caused me to reflect, and what I should do with my blog. Helps to have the holidays to think about it– we’ll have to see what happens next! Congratulations on the anniversary! I don’t have any advice on the direction of your blog except that if it becomes unpleasant to keep writing so often, it’s fine to take a break. People change. Don’t force yourself to stay the same and not grow.